Metal Stud Partitioning is often used in domestic, commercial and industrial projects to create internal partition walls, divisions in warehouse to perimeter wall linings. Various stud sizes and profiles and heights are available to suit the locations and design required. 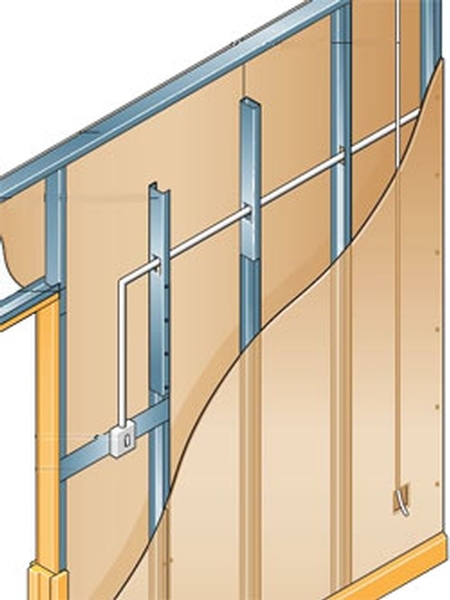 Metal Stud Partitioning consists of a framework of lightweight galvanised metal complete with service slots to assist in the concealment of cables etc within the cavity, onto this framework plasterboard or similar sheet products are fixed using suitable screws. The type of lining can be selected from the range of plasterboards available to achieve the specified fire or sound and acoustic rating required. The cavity within the partition is filled with a acoustic or thermal insulation as required. The outside face of the partition is prepared to receive a skim or tape and joint finish as required. An advantage of this system is that alterations and additions to partition layouts can be made which involves a dry construction with minimal wet trades involved. The above partitioning have a level of fire resistance, and also sound proofing benefits, making it a sensible choice in both domestic and commercial environments in both new build and refurbishment projects.